Forgotten Heroes: Vietnam - The Reverse Slope Defense for "Serious Firepower"
Despite owning several of the titles in the Lock 'n Load system, I'm not very good at it. As a result, I've been reading up on real squad tactics and trying to understand how they can be applied to the game and its varied scenarios. I've been especially interested in defensive tactics since most of the scenarios I play end up with the defenders getting stomped after the attacker finds a weakness in their setup and rips right through it. Of course, the way to prevent all this from happening with great regularity as the defender is to understand the pros and cons of setting forces up in consideration of the available terrain. I'll use the scenario "Serious Firepower..." from Forgotten Heroes Vietnam to just discuss how real life tactics can be translated into game terms. "Tac Air", Avalon Hill's Cold War-turned-hot game from 1987, is about air and ground combat in a modern fast-paced land battle between the Soviets and NATO. 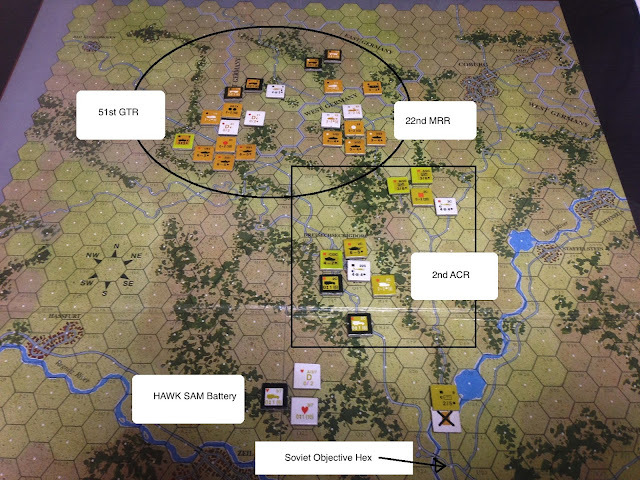 In Scenario 1,"Covering Force", the Soviet 6th Guards Tank Division is pitted against the US 2nd Armored Cavalry Regiment. 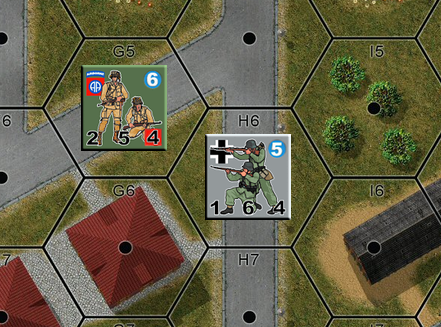 The 6GDT starts with all of its forces in East Germany and its objective is to get as many of their units as possible south to hex T22, a victory hex located just across the border with West Germany and over a river. The 6GDT also want to inflict some damage on the American 2nd ACR, which is presumably covering a retreat by a much larger force that has fled somewhere off the southern edge of the map. The 2nd ACR's job is to prevent the Soviets from reaching the objective hex without losing too many units in the process. I'd like to write up a short article describing how the melee rules in the Lock 'n Load system works. Just to be clear, this is just my own take on the rules. Others may play melee differently and that's fine if it works better for them. This article is intended for those who are just starting with the LnL system and may have played a few games, have some familiarity with the rules, but might be a little hazy on some aspects of how melee works. Melee occurs when two opposing units are in the same hex. Melee in LnL is an abstraction of close range combat where grenades are thrown, bayonets are fixed, and general bloody chaos occurs. Here are some examples to illustrate how the whole process works. I recently played a game of Sniper! (2nd edition) published by TSR way back in 1986. Sniper! 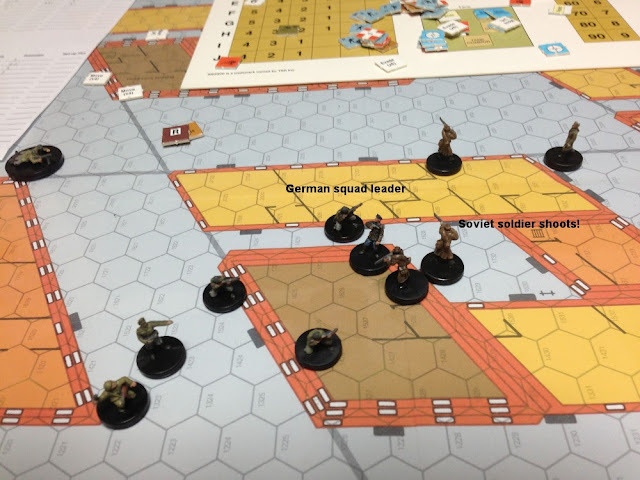 is a single man counter man-to-man combat game not unlike Avalon Hill's Firepower (1984). Although both of these games deal with the same themes and share some similar characteristics (chit pull activations, for one), Sniper! seemed a bit simpler to learn and easier to jump into for someone looking for a casual night of gaming. 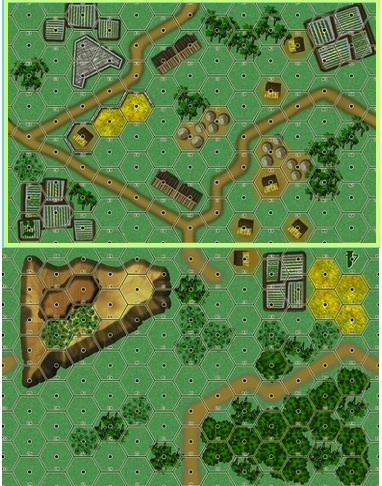 This is a hex-and-counter game but I thought it would be more interesting to illustrate what happened by using miniatures. In the first scenario, two patrols meet each other by chance. The system allows you to pit any forces from WW2 up to more modern engagements and since this was my first game of Sniper! in a long time, I chose to have a chance meeting engagement between a Soviet and German patrol in an urban area in the Orel sector during the Battle of Kursk.